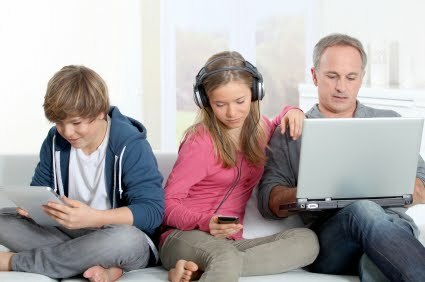 A weekly column helping families with technology. Columns are generally posted at 9 AM EST Saturdays. Families received free gifts from Google last week, as announced at its developer conference. The most exciting is an updated Google Photos. It has added to its already excellent product and removed it from Google+ as a standalone web, Android and IOS product. There are a lot of places in the cloud to store and share your photos. Google now lets you store all your photos at no cost. Tools in Google Photo let you find photos easily. When I typed Great Dane into the search box, it found photos our two Danes. When I searched dog, it found the Danes and also photos of my nephew’s retriever. It also uses facial recognition. I clicked on my son’s face and it found photos of him going back more than 20 years. The phone apps automatically upload your photos to the cloud. There is another app for your PC to upload photos you already have there. Google has renamed its Auto Awesome feature to Assistant. Assistant makes brief films from a set of stills, creates photo stories automatically and does other almost magical tricks with your photos. Google’s Play Store will soon have a kids’ section. App developers could get their app certified for children by jumping through a few additional hoops. Soon children will touch a fun, green, smiling icon that will take them to apps and books appropriate for them. The Play store will use the same rating system we see on boxed software like Everyone, Mature, and Teen. For the grownups inundated with unread emails, Google has made its Inbox product available to all without invitation. Inbox is another way to read your Gmail. It automatically groups like emails together. For example, all my promotional emails from restaurants, stores and online stores are grouped together. I can quickly scan their subjects and archive them all by touching one button. You also can tell an email to go away until a future date and time. It sort of makes Inbox a reminder system. In fact, reminders you create in Google Now show up in Inbox too. Inbox is the first email app that has let me attain the coveted Inbox zero status. Inbox is available for IOS and Android. My family’s favorite gadget got some love too. Chromecast, the little $35 dongle that goes on the back of your TV and lets you stream Netflix, Youtube, Hulu and other sources, all controlled by your phone, now lets you queue up shows to watch. At the start of a day, list the programs you want to watch in order and before you know it your day is gone, as a new program start automatically when the prior one finishes. CBS’ and ABC’s apps let you watch their programs through Comcast. At the recent show, Google announced HBO Now will as well. HBO Now lets you subscribe to HBO even if you do not have cable TV, through the Internet. Google spent a long time talking about the upcoming Android M, the newest version of Android. Android M will appear on new phones this fall. Some recent phones may receive upgrades, but probably not for a year or more. The big feature in M is custom permissions. Now, when you install a new app, it lists the permissions it needs and you have to accept them all or not to install the app. With M, you can deny certain permissions. When the app tries to do something needing a denied permission, it will prompt you and let you grant the permission temporarily or permanently. We’ve seen many apps asking for permissions they should not need, like a Flashlight app that tracks your location or accesses your contact list. Now we can control that. There are also improvements to the payment system, once called Google Wallet and now called Google Pay. Also, software for a fingerprint scanner is built in leading some to believe the death of passwords may be coming. Android M can be taught not to demand you type in your unlock code if your phone is near your Android Wear watch. The assumption is if the two are near each other, then the phone has not been stolen. That’s almost a reason for me to get a watch by itself. For more of Mark’s online activities and contact information, visit markstout.info. Links for this column are here. To subscribe to the print edition of Prince William Today, visit their website. A weekly column about technology for families. Previously published from September 2009 to December 2012 by The News & Messenger, Manassas, Virginia. Those earlier columns are no longer online. Copyright 2012 - Mark A. Stout . Awesome Inc. theme. Powered by Blogger.